Sprinkle catfish fillets with salt and pepper; place in 13x9-inch (3-quart) microwave-safe baking dish. Cover with microwave-safe waxed paper. Microwave on HIGH for 5 to 8 minutes or until fish flakes easily with fork. With slotted spoon, remove fish from baking dish; place in large bowl. With fork, break fish into small pieces. Add cornmeal, baking powder, onions, bell pepper and Creole seasoning; mix well. In small bowl, combine buttermilk and egg; blend well. Add to catfish mixture; mix well. Heat 1 tablespoon of the oil on griddle or in large skillet over medium-high heat until hot. Drop catfish mixture by 1/4 cupfuls onto hot griddle; flatten to form 8 patties. Cook 2 to 4 minutes or until lightly browned, turning once. Add remaining 1 to 2 tablespoons oil as needed during cooking. If desired, serve catfish cakes with tartar or cocktail sauce. Cajun seasoning is a bold mixture of celery, chiles, salt, red pepper, paprika, mustard, garlic and onion. White or yellow cornmeal can be used in this recipe. We used yellow cornmeal for a bit more color. Try another freshwater fish, such as perch or trout, for these fishcakes. 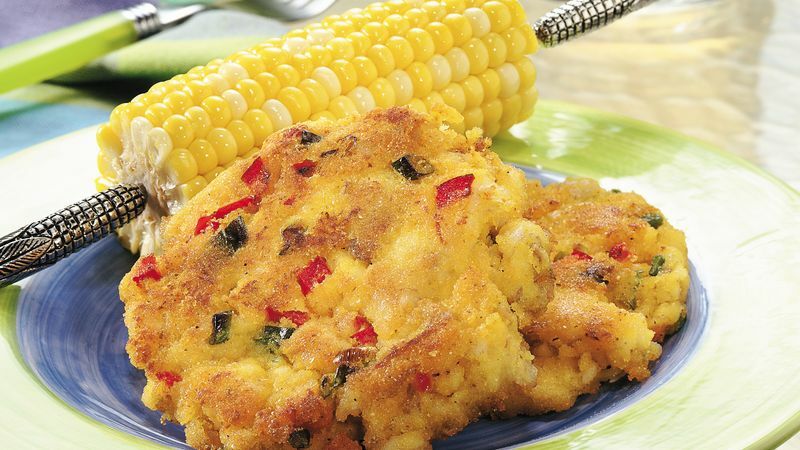 For Cajun Crab Cakes, Cajun Crab Cakes, use three 6-ounce cans of lump crabmeat in place of the fish. Drain the crabmeat well before use. The catfish cake mixture also makes a great appetizer. Use rounded tablespoons to create bite-sized cakes.